It’s no secret that lake troutt have become the most numerous fish in Lake Michigan and you cannot consistently win tournaments without spending most of your tournament and pre-tournament days targeting them. Although lake trout can position themselves throughout the water column, for example, in mid-level temperature layers where the bait and other sport fish like salmon are found, they spend a large portion of their time on or near the bottom of the lake. This tendency to hug the bottom is especially true during the middle of the day when the sun is bright. In addition to being drawn to investigate flashers and lures trolled in the bottom-hugging zone lake trout prefer, these fish will positively respond to the stirring up of bottom sediments. It seems the more you can stir up the bottom by occasionally dragging (it’s really more like skipping) your lures and/or occasionally bouncing your downrigger ball on bottom the more lake trout you will catch. Some avid trollers targeting lakers will extend a short length (18-to-24 inches) of chain or wire from their downrigger ball to help draw these bottom-hugging fish into their gear. The reason adding a short length of chain, such that it will scratch bottom occasionally, is used is that it will accomplish the goal of stirring up bottom sediment without jeopardizing the loss of your downrigger weight. Keep in mind this technique is best used when trolling over flat bottoms and not where bottom structure makes just skipping the bottom difficult or impossible. Another method used to stir up bottom sediment is to employ a triangular shaped flasher, like an 8 or 10 inch Fish Flash, which will stir up bottom sediment without hanging up or tripping from your downrigger release. Try running near bottom, occasionally touching sandy bottoms, in combination with a 48-to-60 inch leader and spoon, spinner, Spin-N-Glo or spinning bait. You want your gear running fairly close, ten (10) feet behind the downrigger ball, so it will be in or near the sediment cloud. An all-time-favorite trolling combination used by anglers wanting to target lake trout is to rig a size 2, 4, or 6 Spin-N-Glo in combination with a size 0 or 1 dodger. The dodger’s side-to-side swaying motion adds additional action to the already lively Spin-N-Glo and is the go-to combination for many charter operators and avid anglers. Most rig their Spin-N-Glo 24-to-30 inches behind their dodger. It’s important to place a few plastic beads between your Spin-N-Glo and hook so this lure will spin freely. Some of the more productive Spin-N-Glo colors for lake trout are Luminous Spot, Stop N Go, Luminous Green, California Watermelon, and Red Hot Tiger. These finishes are now available with glow-in-the-dark wings. So, in addition to the phosphorescent bodies the wings also glow. To see them visit www.yakimabait.com or ask your local dealer. And it’s not just dodgers that are used in combination with Spin-N-Glo. Take last year’s Salmon-A-Rama “Yakima Bait Rewards Program” winner who trolled a Spin-N-Glo in combination with Fish Flash to take home real money – it could be you this year. This entry was posted in How To Fish, Trout and Salmon on June 30, 2016 by ronniegarrison. After once sitting atop the heap, this year Alabama’s Lake Guntersville did not make the top 10 in the annual listing compiled by Bassmaster Magazine of the nation’s top bass fishing spots. Toledo Bend Lake in Texas topped the charts this year, for the second year in a row. In fact, Guntersville did not even top the southeast division, where it came in 5th. Santee Cooper in South Carolina was listed as the tops in the southeast. And G’ville was only the third best lake in the TVA chain. Both Chickamauga, upriver, and Kentucky Lake, downriver, were placed above the 70,000 acre North Alabama lake. What’s happened to the big lake–the economic driver of much of the economy in Jackson and Marshall counties? Nothing unusual, according to biologists with Auburn University and with the Alabama Department of Conservation and Natural Resources (ADCNR). “We’re seeing a natural downturn at Guntersville, the result of what we call recruitment, or the success of spawning, in past years,” says Matt Catalano, assistant professor of Fishery Science at Auburn. “The lake had an outstanding year class in 2008 when a huge number of the fish that were hatched survived to eventually become adults, and by 2011, anglers were seeing the results of this year class in their catches–there were more 15 to 18 inch fish than ADCNR had ever recorded in a continuing study of over 20 years at the lake,” said Catalano. Catalano said that continuing studies indicate that there are now more fish over 20 inches than there have been at any time during the study years, but that the more numerous 15 to 18 inch fish have fallen off to an average figure that’s 30 to 40 percent below the numbers in the 2011 peak. “We don’t measure angler success, but with that many fewer fish in the mid-ranges, it’s sure to have an impact on the fisherman’s success,” said Catalano. What brought on the big year class in 2008–and can the lake be manipulated to make it happen again? “There seems to be correlation between years with low water flow from the spawn on into June and having a high survival rate of the fry,” says Catalano. Low flow typically results in clearer and shallower water, which results in more aquatic weed growth, and in return this builds a strong food chain as well as providing lots of cover where young fish can hide from predators. Since Guntersville is part of the TVA chain, controlling the water levels to benefit the fish is probably not an option. The lake levels are manipulated to maintain navigation for commercial traffic, and for flood control; fish and fishermen have to deal with what Mother Nature give us. However, Catalano said there’s some evidence that past stocking of Florida strain bass has helped improve the overall genetics in some areas of Guntersville, and heavy stocking could have a good result in a year when the natural spawn is down. 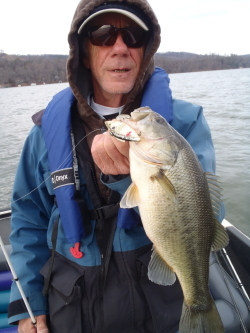 Changing the rules for anglers to reduce bass harvest, on the other hand, does not seem likely to produce much result. The Lake Guntersville Conservation Group, formed to try bringing the fishery back through stocking and other efforts, has slated its next meeting for July 31 at Goose Pond Bait & Tackle, on the water just south of Scottsboro, at 3 p.m. Those who would like to join the group can contact Sharon Carter at 256 218 0613. This entry was posted in Bass Fishing, Conservation on June 28, 2016 by ronniegarrison. When I was six years old I had my tonsils taken out. As a present for being such a “big boy” during the surgery I got a BB gun, my first gun of many. I was extremely proud of that gun and it was my constant companion for the next two years, carrying it almost everywhere I went. It was a great way to learn gun safety and prove to my parents I could handle a gun responsibly. During the next two years I got my second gun, a semiautomatic Remington .22. That rifle had a tubular magazine that held 16 high power Long Rifle bullets. The boxes those bullets came in had the warning “Danger, range one mile” printed on them. I was not allowed to take that gun out of the house unless an adult was with me. Daddy took me out to shoot it fairly often, and I killed my first squirrel with it when, at eight years old, I saw one in the woods across the road from the house after school one day and got Gladys, our housekeeper, to go out with me since nobody else was at home. My parents accepted that I had learned gun safety at that point and I was allowed to go out with my gun, only if alone or with an adult, for two more years. At ten years old I was finally allowed to go out with my friends. For years we hunted together during season and carried our rifles every where we went, even when no season was open. No one gave a second look to three 12 year olds walking into town with our rifles, propping them by the door of Mr. John Harry’s store and going in to buy a coke and pack of crackers for a nickel each and a box of bullets for our rifles. A box of 50 Long Rifle bullets was 62 cents, if I remember right. The summer I turned 18 I graduated from high school, was accepted at the University of Georgia for that fall, registered for the draft and got a job making roof trusses for a pre fab construction company. One day that summer a few weeks before my 18th birthday I went to buy some .22 bullets at Mr. John Harry’s store and he told me he could not sell them to me since I was not 18 yet. Although I knew automatic guns and sawed off shot guns were illegal, that was my first run in with so called “common sense gun control laws.” It took five years after President Kennedy was killed with a mail order rifle for congress to “do something” and pass a law that banned mail order sales of guns, as well as sale of rifle ammunition to anyone younger than 18. That gun control law was supported by the NRA, because it was just the start of the long history of “doing something” that always ended up restricting gun owners rights while doing nothing to have any impact on crime. It sounded somewhat reasonable and didn’t restrict gun owners rights much so it was not opposed. The NRA and I have learned the camel in the tent proverb now and oppose such silly laws since we know if you let a camel get his nose in the tent you will soon be sleeping with a camel. In the 48 years since that law was passed every time someone uses a gun illegally and makes the news the knee jerk reaction is to “do something” that involves restricting gun owners rights. So now I and many other gun owners oppose all such silly “do something” bills. Right now the big push is to renew a 1994 law banning some guns because of the way they look. The “assault weapons” ban lasted ten years and was allowed to expire in 2004 because facts showed it had absolutely no effect on gun crime. But now gun banners are trying to bring back such a totally ineffective law. Rifles of all kinds are hardly ever used in crime. And the way they look had no impact on the way they work. For example, the 1994 law banned the sale of a common gun called an AK 47. So the foreign manufacturers of the AK 47 took the working metal parts of the gun, put them on a different looking wooden stock, and sold it as a MAK 90. I bought one, mostly out of protest for the stupidity of a law banning guns because of fear. It is fun to shoot, bullets are cheap, and even with a 30 round magazine it has never committed mass murder. I also own an AR 15. It sits quietly in my gun cabinet with its 30 round magazine loaded and attached, and has never jumped out to go shoot somebody. It only comes out to go out to the farm and the only thing it has shot is some paper and a couple of deer. Another big push is to close a myth, the “gun show loophole.” Since it is a federal felony to sell guns without a FFL unless it is your personal firearm, and any FFL seller must run a background check, there is no loophole. Expect to hear calls and see childish actions like a sit in shutting down the government because you don’t get your way. Just remember any new law will be as effective in lowering gun crime as the law that stopped me from buying .22 bullets, bullets I had been buying for six or seven years, when I was 17 years old. This entry was posted in Guns and Gun Control on June 27, 2016 by ronniegarrison.